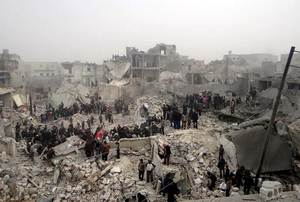 At around midnight between Feb. 18 and 19, 2013, a residential area of the eastern Aleppo neighborhood of Jabal Badro suffered a missile attack. Several homes were flattened, and approximately 20-30 initial deaths were reported, including several women and children. The final death toll is sure to be higher once the digging is done, and the number of injured - some of them gravely - will be higher yet. It's reported that a powerful, Scud-style, surface-to-surface missile or rocket, and apparently only one, was responsible. That class of weapon seems to fit with the massive damage seen in next-day opposition videos. 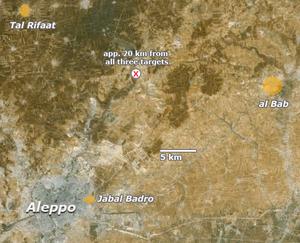 Jabal Badro is reportedly a rebel-held district, as well as rebel-free and of no strategic value, according to some rebel assessments. The attack comes in the context of a recent rush of powerful surface missile attacks around Aleppo in the days before and after, and a somewhat longer alleged campaign against the north of Syria in general, fired from Damascus after it "lost control" of half the country. A more famous attack was done in broad daylight at Aleppo University a month earlier - a government-held area - killing at least 87 and wounding hundreds. There, LCC, SOHR, and most rebel sources (citing activist "witnesses") described a government fighter jet attack, while Syrian authorities, mainstream Western weapons experts, and in fact the evidence suggest powerful, Scud-style, surface-to-surface missiles, of perhaps the same type now being eagerly identified and reported flying all over, but only around midnight. This page is currently a stub. The discussion page, however, is not. This page was last edited on 11 March 2013, at 12:25.